Breakin News India 360: RPS VS GL : Andrew Tye became Hat-trick Hero! This blog website is give you live scores current matches, news and more interesting latest stories related to the cricket. Follow us on google plus for More News update. 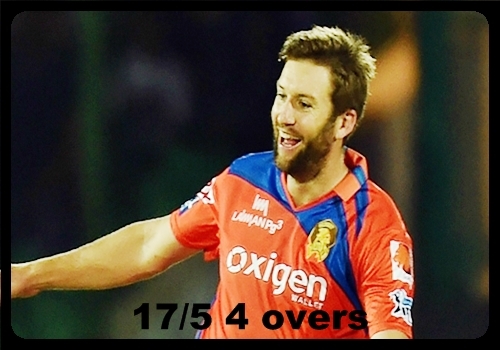 RPS VS GL : Andrew Tye became Hat-trick Hero! What a Friday it has for the bowlers! It becomes Fantastic Friday for them. Yes! first Samuel Badree in the game between Royal Challengers Bangalore and Mumbai Indians at Bangalore in the match No.12 of IPL this season, Now turn of the Gujarat Lion's bowler Andrew Tye against Rising Pune Supergiant at Rajkot on Friday night game. In the evening Samuel became 12th bowler who gets Hat-trick in the IPL history. Now Andrew Tye became 13th bowler by taking Hat-trick wicket in all IPL and second of this season 2017. This is overall 16th IPL Hat-trick which gone happened on Friday 14th April. He was managed to got 5 wicket in this game and became first bowler who took 5 wickets in this season 2017. If you like this! please like, share and hit following button for more updates. M S Dhoni : The Untold Story, Something you didn't know about this? IP 2017: Suresh Raina becomes 1st player to feature in IPL matches! Kieron Pollard 7000* runs 'NOT OUT'! Virat KohliI THE LION IS BACK!!! MI vs SRH: MI won by 4 wickets! Warner played one extra ball!? RPS VS DD: Smith missed out due to? Pakisatn beat West Indies and sealed series.